TERRE HAUTE, Ind. 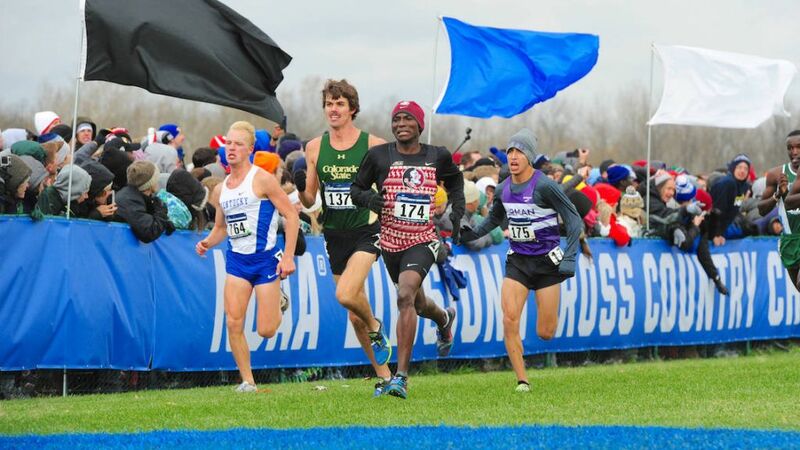 – On a cold, blustery race day against the top collegians in the country, Florida State’s Carmela Cardama Baez and Harry Mulenga took opposite approaches to Saturday’s NCAA Cross Country Championship races at the LaVern Gibson Championship Course. Cardama Baez was battling uphill after a conservative start in the field of 250 finishers, but came on like gang-busters over the final 4000 meters of the 6000-meter race. The sophomore from Spain roared past 84 runners in that span and finished 73rd (20:41.79) in her NCAA Championships debut. Mulenga, a senior, was front-and-center in a huge lead pack from the outset. The Zambia native was 11th at 3000 meters and 32nd – but very much in the thick of things – at the 5000-meter midway point, but was unable to hang on. Despite a dramatic improvement from last year’s finish (153rd), he came home 82nd overall in 30:45.8. The end results weren’t what either had hoped for, but then, neither were the conditions. A cold front came through the area Friday night and while the course was dry despite heavy rain, the temperature was 37 degrees at the start of women’s race and the wind chill made it feel like 25. “It took a lot of moxy for our kids to take on a 50-degree weather change and still compete their tails off,” Florida State men’s coach Bob Braman said. Cardama Baez was the first to go in the conditions with the 11 a.m. start. “She was great; got out a little slow and was stuck a bit but she looked great and kept her composure and worked the entire way passing people,” FSU women’s coach Kelly Phillips said of her two-time All-ACC, All-Region performer. The tightly packed field and the winding course made it difficult to move up until the middle stages of the race, where Cardama Baez made her charge. “She had a fantastic race and a great season and next year she will be here with her team and go for All-American honors,” Phillips said. The men’s race followed at noon, with temperatures rising ever-so slightly. Mulenga heated up quickly and near the front of a giant lead pack, in the company of three-time defending champion Edward Cheserek, eventual champion Patrick Tiernan (Villanova) and runner-up and ACC champion Justyn Knight of Syracuse. Cardama Baez & Mulenga NCAA-Bound!